Updated: April 2, 2018. Full disclosure, I started working at Omaha Children’s Museum after this post was written. 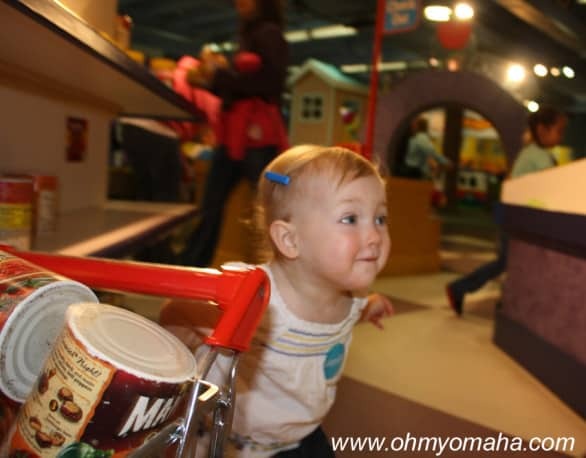 Ever since Farley was a roaming toddler, we’ve had a family membership to the Omaha Children’s Museum. He could play, he could create, he could learn. And for exhausted parents, it guaranteed a tired kid at the end of the day. When Mooch came along, it became her playground too. Mooch has loved shopping at the museum’s grocery store since a young age. I’ve often written about our adventures there, checking out the newest exhibits, enjoying the special events that we could attend for FREE with our membership (like themed nights or seasonal exhibits like the one opening soon – Santa’s Magic). Our loyalty to the museum through annual membership and frequent pictures shared from our visits helped secure a partnership between me as a writer and the museum as a major attraction in Omaha. Part of that awesome partnership is a complimentary membership for my family. I would’ve renewed ours anyway and continued to tell you all about our adventures there, but this way I can help the museum out in areas they need (beyond just some mom raving about how awesome everything in general is). Loving a low key night at Omaha Children's Museum. The late hours are so convenient because we can't go during the week otherwise. One thing I haven’t written about much is all the perks we get with our family membership to the Omaha Children’s Museum. It goes beyond unlimited, FREE admission to the museum. *Discounted admission to over 250 science centers as a part of the ASTC Passport Program. Learn about how that reciprocal membership works. Give the Gift of Play: Already a member? Give the gift of play this holiday season to a family you love so they can enjoy a whole year of fun. To see what special exhibits are in the museum or upcoming, visit here. Congrats! You found the hidden giveaway celebrating this blog’s fifth anniversary! In March and April, I’m giving away passes and tickets to some of my favorite things. 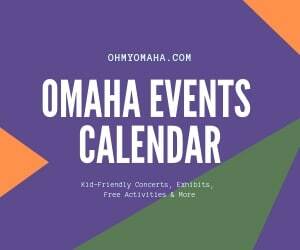 This week, you can enter to win a family four pass to Omaha Children’s Museum (disclosure: I work there). Use the Rafflecopter form below to enter. The giveaway ends April 8, 2018 at 11:59 p.m. CST. I’ll draw one winner and contact him/her via email within 48 hours. Winner has 48 hours to reply before I draw another winner. Must be 18 or older to enter; prize has no cash value. Good luck! I think it’s probably time for us to get a membership! Definitely! Even when they’re little, kids have so much fun there. We really should get a membership and visit more often. They always have so many neat changing exhibits. We love the Children’s museum! My boys are getting a little older now so we haven’t had a membership for a year or two, but the Teenage Mutant Ninja turtle exhibit sounds like a whole lot of fun for my boys! All my boys have enjoyed visiting the Children’s Museum and each had a favorite area! My youngest, age 8, would love TMNT!!! My boys, ages 3 and 6 love going to the Children’s Museum. We only make it there once a year as it is but I know if we had a membership we’d go more often than that. The TMNT exhibit sounds amazing and my kids could spend the entire day in the room with the foam balls that they can shoot and have drop down on them. They love it! I love this place. So much to do! This is such a fun Spring giveaway especially given this cold weather we have been having lately. The Children’s Museum is a great place to take my kids. They both love it! My daughter LOVES science. I think she’d love to see the new additions to that area. I’ve taken my kids to the Lincoln Children’s Museum, but never the Omaha one. I think it’s about time I did. Sounds like a lot of fun exhibits! 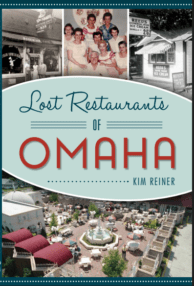 We drive in to Omaha often for day trips, but have not made it to the Children’s Museum yet. My daughter would love to visit the Children’s Museum!! My kids always love to go to the OCM! I think the new STEAM caves sounds fun!